Nothing tops off a great day of camping better than a good meal and nothing makes this easier than having a well planned out food preparation area. 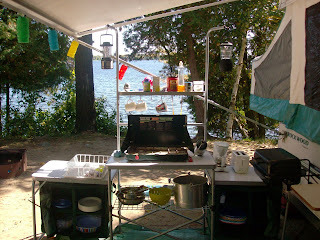 Over the years, I have prepared meals on river shores, on rocks and on logs put together to form a primitive table, but when trailer camping, I am looking for ease and organization. I have seen and researched various camp kitchens available today and to the best of my knowledge, the Deluxe Camper’s Kitchen from Cabela’s has them all beat. This sturdy work centre features 3 preparation surfaces, a stainless steel pot rack, loads of storage space as well as lantern hooks and a spice rack. It folds up easily and comes with a storage bag. If you are considering the addition of a camp kitchen to your gear this year, give the Deluxe Camper’s Kitchen from Cabela’s a look. At under $200, it keeps all of your utensils and ingredients together and makes preparing dinner for the group a lot more enjoyable.